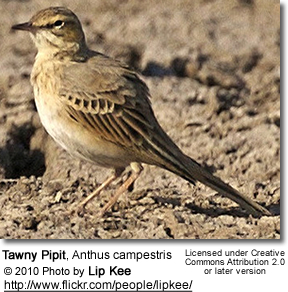 The Tawny Pipit, Anthus campestris, is a medium-large passerine bird which breeds in much of temperate Europe and Asia, and northwest Africa. 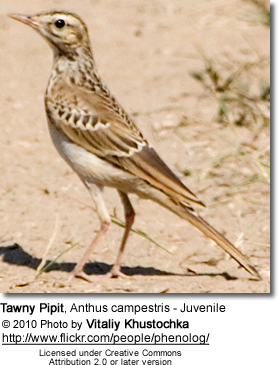 It is a migrant moving in winter to tropical Africa and the Indian subcontinent. This is a large pipit, 16.5-18 cm long, but is an undistinguished looking species on the ground, mainly sandy brown above and pale below. 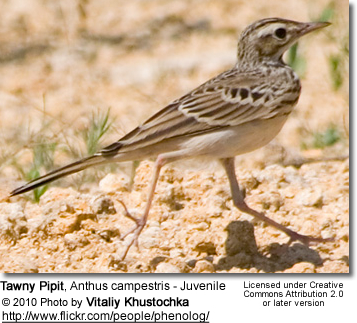 It is very similar to Richard's Pipit, but is slightly smaller, has shorter legs and a shorter dark bill. It is also less streaked. Its flight is strong and direct, and it gives a characteristic "schip" call, higher pitched than Richard's.